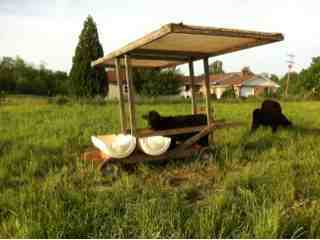 We have had a few iterations on our portable cow shade. The first one blew apart one windy day...we do live in an area called bald hill, and it must be because of the wind that whips through here sometimes. Homer builds things strong, so they can take abuse, but had to make design adjustments to withstand the 50+ mph wind. 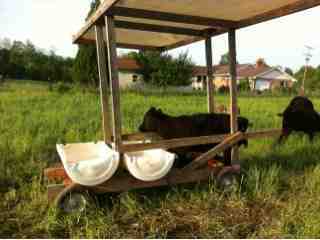 The structure we have now provides shade, water, a couple of tubs for kelp and spots for salt and mineral lick. This is our 3rd year using it, and on hot sunny days in treeless paddocks the herd is found in the heat of the day chewing their cud in the shade. Never before have we seen this happen. This animal is just short enough to fit under the cross brace, over the kelp tubs, and stretch over to the water barrels. Most just walk up to the water barrels and get a drink. This one decided to get creative. Homer will be adding another 2x4 to block this and stop it from happening. Stuck. And breaking stuff. Livestock.